Oh these are LOVELY - so much depth and texture and color and creativity. I almost picked the Atebus one, but the Arctic one won out. I love blue. I almost wish i liked browns and greens because the Riverside one is so pretty and the colors give it a certain added depth. And i fear i'm going to go hoarding loads of ornaments. SHINY! I'll probably load up on blue (especially all the shiny turquoise blue stuff) and add some silver, deep reds, and gold. There are certain ones i'll try to get, like the planet one. Hurrah for them making something to lure me back in with all the SHINY. I'll have to make screencaps since i fear it won't be around long enough for me to tire of it. shaelyn76 wrote: Ierosbats, those are all really good questions. The other thing that I have noticed is that there are a few items that have bauble or ornament in their name, but don't have the option to add to your ornament collection..what up with that? The site is lagging really really badly so I don't want to brave the forums to try and see if any of the questions have been answered yet as I'm sure you and I aren't the only ones wondering. All existing tree ornaments/baubles/decorations are being made "wearable" (artists are working on it!) and a bunch of new ones are being drawn to fit all the different themed trees. There should be garland at some point, too, I believe. Ierosbats, I gather that it's hard to make lights that hang differently because they have to work on all 12 tree bases -- they need to hit predefined points. I really enjoy this. Looking around the forums, I feel like I'm the only person to pick the spindly old Shadowglen tree. I covered mine in colorful baubles and put a zeppelin on top. That's really awesome, Cranberry! I take it there are multiple tree toppers available too, then. And where do you go to look at your full-sized tree unhindered like that? Thanks, nice to have those links handy. I discovered them after playing around on the news links. Right now, i'm refreshing the Free Shop and Holiday Shop pages. Right now, my tree is bare except for it poking Melody up her dress. It really is a pretty decoration and will probably be the one i keep there. 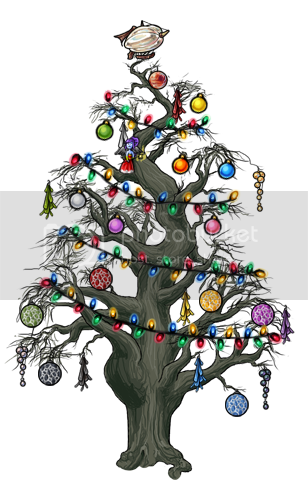 Another question - is there a way to remove ornaments from the tree decorating area and put them back into your inventory? Some ornaments look very different when they're on the tree - sometimes that's a good thing, and other times not so much. I have a gallery for free ornaments that i don't plan to use, so if any of them appeal to you, let me know. It didn't take nearly as many ornaments to decorate my tree as I thought it would, so I've got some extra. I put them here in the Ornaments section of my gallery, so if anyone wants any of those, let me know and I'll give it to you. I wouldn't say no to a silver or red bauble if someone has some from the Free Shop they don't want. Now that I've got a few ornaments I'm getting into this more. I think there needs to me more reasonably-priced tree toppers. I did find a Kumos Angel in my Vault but at the current prices I'm tempted to sell it rather than use it. At least I don't want to commit it to the tree yet given that we can't take them out. Also, how about some garland? And I second the bows suggestion. Sent some to you, Wingsrising. I just poked around again and read that the ornament lot is permanent. I wish we could take ornaments out...as i said, some ornaments don't turn out to be my taste as expected, and they're just taking up space when someone else might like them more. I also think it would be handier if we could take the items out again (or at least if it were easier to get a preview). I keep missing the Free Shop restocks by a minute or two, gah! I like the tree idea. I do wish they had got it running a bit sooner. I tossed a bunch of free decorations and cheap lights on my tree. No time to do more because this is going to be a busy week. It would be nice if you could rotate the ornaments. Some of mine don't look like they are hanging at all. Fjorab_Teke wrote: I just poked around again and read that the ornament lot is permanent. I wish we could take ornaments out...as i said, some ornaments don't turn out to be my taste as expected, and they're just taking up space when someone else might like them more. We can't take them out? Dammit, now I need 2 of all the yummy ornaments. DISLIKE! Tried the Mystery Box, and got a couple I could use. Free Shop isn't giving me anything good. So now it's vending time! Anyways, the trees are a fun thing to play with. I chose the carnival tree, 'cause... it's yummy. It appears that we can move them back to inventory now. I think this is a good move and makes me more likely to use pricy ornaments instead of selling them. Yay for being able to remove ornaments! In other news, the Mystery Box is being much nicer to me! I've gotten a couple of ornaments I want and plenty more (which I'm putting in my Hoarding shop, so if you want something, let me know). If whoever is sending me gift boxes full of food is from Neocolours, I'd like to give you a heartfelt thank you! Here's my tree so far. As you can see, I went for the traditional tree. I also decided to go ahead and use the tree topper now that it's removable. When I get enough red stuff, I want to try red and gold, too. Would it be worth having a thread to post people's trees?